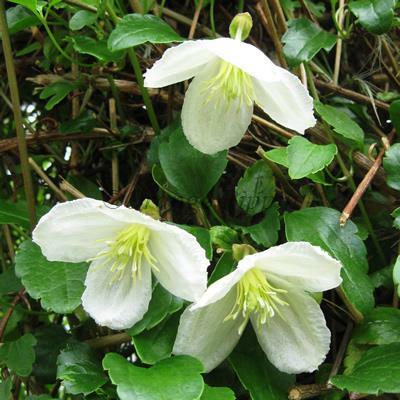 An evergreen Clematis originating from the Mediterranean, Clematis cirrhosa 'Jingle Bells' produces masses of small, sweetly scented, nodding, bell-shaped, creamy-white flowers during the late winter. Clematis cirrhosa 'Jingle Bells' was raised by nurseryman Robin Savill of Pleshey, England. It was a chance seedling of Clematis cirrhosa 'Freckles'.